Three days of arts, literature and science are kicking off in Scotland's national book town. The Big Bang Festival in Wigtown - which runs until Sunday - is now in its second edition. Director Jessica Fox said the aim was to "inform, educate, entertain and inspire people of every age". Driverless cars, alien life on other planets and Mary Shelley's Frankenstein are among the topics contained in the programme. American comedian Jono Zalay, who swapped the neuroscience lab for a career in stand up, said he "leapt at the chance" to take part. "I loved the idea of a festival bringing together art, science, literature, music and comedy in Scotland's national book town," he added. Ms Fox said Wigtown was the "perfect place" for the festival. "We will be having world-leading scientists here to talk about the latest research into everything from life on other planets to creating machines that think for themselves," she said. "There will also be a special appreciation of James Clerk Maxwell, one of the world's greatest scientists, who came from Galloway. "As we are right next to Galloway's Dark Sky Park, which people come to from across the world to stargaze, we are really delighted to be having a planetarium show that introduces people to the wonders of the universe." 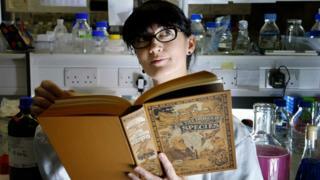 She said Scotland had a "fantastic tradition" in science and was at the forefront of a lot of exciting research. "This weekend will not only share some of what is going on, but we hope it will inspire a new generation to take up the baton and consider careers in science," she added.